That horrid title is my Valley Girl lingo attempt. But thankfully, like you, I’ve forgotten how they talked. I have not, however, forgotten about our 2008 CT Wine Tour goal of hitting 14 of these joints before November 7th. It’s Halloween night right now and Damian is a bit sick… so it’s going to be tight. But Hoang’s into it and the chance at a the prizes is worth the “sacrifice” of driving around the prettier parts of the state sampling wines. I’d heard lots of positive things about this particular winery – not only was the wine “exemplary,” but the atmosphere and owners were great too. 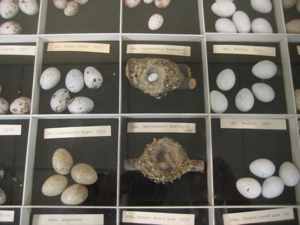 (The location, right on Route 202, is also nice.) 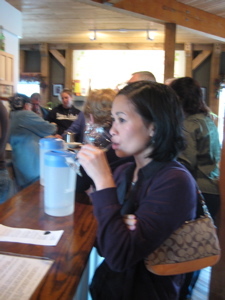 So Hoang and I arrived with high expectations after our earlier visit out to the Land of Nod Winery in East Canaan. Apparently, we weren’t the only ones hip to this winery. The place was packed. And it didn’t appear to be one large contingent either; it seemed to just be lots of small groups enjoying their wine. That said, the young guy behind the counter, associate wine-maker and son of the owners, was fairly attentive to us – which is always nice. We’re younger than a lot of wine people and we admittedly don’t know much about wine. But the guy gave us our tasting professionally and honestly, while serving other people just as well. As for the wines we tasted… most were… what you’d expect at a central Connecticut winery. As a matter of personal taste, I tend to go for the drier wines. The chardonel (A white hybrid grape with characteristics of Chardonnay and Seyval) was the best of the white bunch for me. Their highest seller, “Raspberry Delight” was right up Hoang’s alley. Admittedly, I didn’t taste it, as I like to let her enjoy the sweeter varieties all by herself. I do not like sweet wines or dessert wines or back-sweetened wines, no matter who is making them. CT Valley seems to focus on these types of wine a bit too much for my liking. To each their own. I found the reds to be decent as well. The Black Tie Cabernet was good; one of the best deep reds I’ve had in the state. While I can’t quite remember which of their other reds we tasted, a quick double-check with Hoang confirms, “They were all really good.” Checking their website, I can confirm we tasted Deep Purple Chambourcin and Midnight Frontenac – both delicious. Of course, what do we know? What do the experts say? Vineyard & Winery Management Magazine’s Grand Harvest Awards is the only wine-judging event in North America that is based on terroir – a group of vineyards (or even vines) from the same region, belonging to a specific appellation, and sharing the same type of soil, weather conditions, grapes and wine making savoir-faire, which contribute to give its specific personality to the wine. 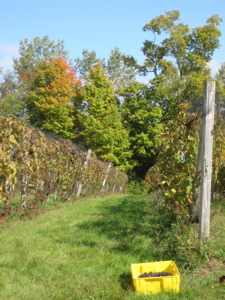 Connecticut Valley Winery won a Bronze medal for their Chardonel in the 2008 competition. 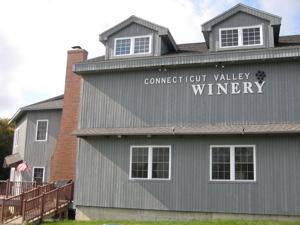 Connecticut Valley Winery won Silver and Bronze Medals for Dolce Vita and Black Tie Cabernet Franc respectively in the Big E Northeast Wine Competition. Of course, we’ve also learned during this Wine Trail tour that almost every vineyard has won some accolades from somewhere at some point – especially at the Big E. The driveway was dirt (as they often are – I’ve learned this is because the tractors traverse the driveways and pavement simply wouldn’t stand up to the constant weight), and the building was very nice (as they usually are), and the employees were nice and accommodating (as they only sometimes are), so it was a very good experience. I didn’t take too many pictures because it just seemed like I was intruding on all the other tasters who seemed to know more about what they were doing than we did. We also didn’t get a wine glass here, which is all well and good because the glasses we tasted from were of squat and very wide (“to gain a better nose,” I overheard someone say) and wouldn’t have fit nicely into our cramped cupboards. 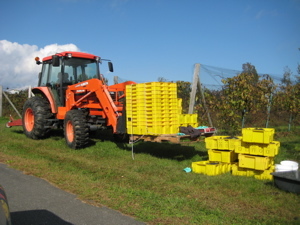 Located in Connecticut’s picturesque Litchfield County, Connecticut Valley Winery is owned and operated by Anthony and Judith Ferraro. With a passion for offering the highest quality wines, while preserving all the charm of a small, family-owned winery, the Ferraros offer an unmatched wine experience in one of the most beautiful and intimate of New England locales. 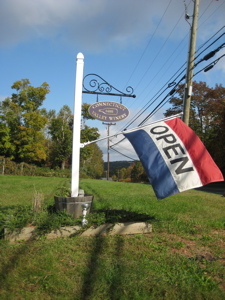 The Ferraro’s commitment to providing the highest quality wines have made their wines increasingly popular with local wine enthusiasts and a must-stop for tourists participating in Connecticut’s Wine Trail Passport Program. 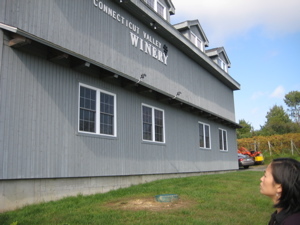 Ten years after this visit, CT Valley Winery is still going strong. They haven’t updated their website since 2011 though. There is now a CT Valley Brewery in South Windsor, which is actually in the Connecticut River Valley, as opposed to New Hartford. Sorry, you know me… I have to throw in my geographic picadillos whenever I can.